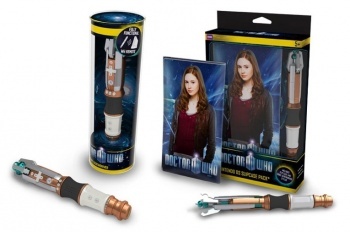 Doctor Who fans' dreams of owning an affordable sonic screwdriver have finally come true. If you've always wanted to pretend your television is a Dalek and waggle a sonic screwdriver at it all day long, you're in luck. The BBC has teamed up with Blue Ocean Accessories to produce Doctor Who-themed accessories to go with the Doctor Who videogames coming to the Nintendo Wii and DS. They aren't slapping Doctor Who's face on a set of cases and calling it a day either. No, any Doctor Who fan that owns a Wii will absolutely have to get his/her hands on Blue Ocean's Doctor Who Wii Remote, which is in the shape and design of a sonic screwdriver. The sonic screwdriver is Doctor Who's iconic tool that he never leaves the TARDIS without. As if that wasn't enough, DS owners can also get a sonic screwdriver-shaped stylus. And if you did happen to want Doctor Who's face plastered on your DS, there will be slipcases released featuring both he and his current sidekick Amy Pond. The accessories are reportedly planned for launch in October, just like the upcoming games, though only in Europe far as I can tell. Please just don't think owning them qualifies you to take on a Cyberman.